Mexican food!! I’ve said it before, I am not an expert when it comes authentic Mexican food having grown up in a culture that considers Taco Bell “Mexican” food. I hear there are a few places in Vancouver that offer up true Mexican food and one of those places is La Casita in Gastown. Raul Pacheco, aka Hummingbird604 has said he likes La Casita and he’s from Mexico so that says a lot. My wife and daughter met me downtown recently and we ended up at La Casita mostly due to convenience. We grabbed a table by the window so Hayley could watch the world go by but we still ended up be the people in the restaurant with the randomly screaming baby…joy. 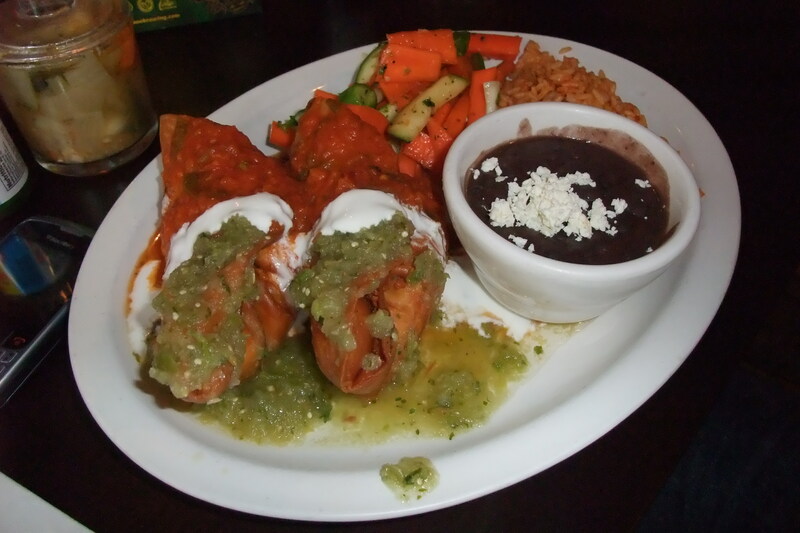 I ordered the Chorizo Chimichanga which may or may not be authentic Mexican but it was damn good. A deep fried tortilla filled with cheese, beans and chopped Chorizo sausage and covered with salsa and sour cream. The presentation was 100% better than any “Mexican” restaurant I’ve been to, it looked like someone cared how the plate looked instead of being a pile of rice, a similar pile of beans and a tortilla on a plate. The sausage was mild and tasty and cooked just right with a nice crunch from the tortilla. The beans were good, not great and the rice was the same, not outstanding but very good. The vegetables were really quite good though, usually an after thought in a dish like this they were fresh and seasoned with a savory salt and spice mix that took them above and beyond what you would expect from a side of veggies. Unfortunately we forgot to unhook Hayley’s toys (rattle, ball, rings etc. ) 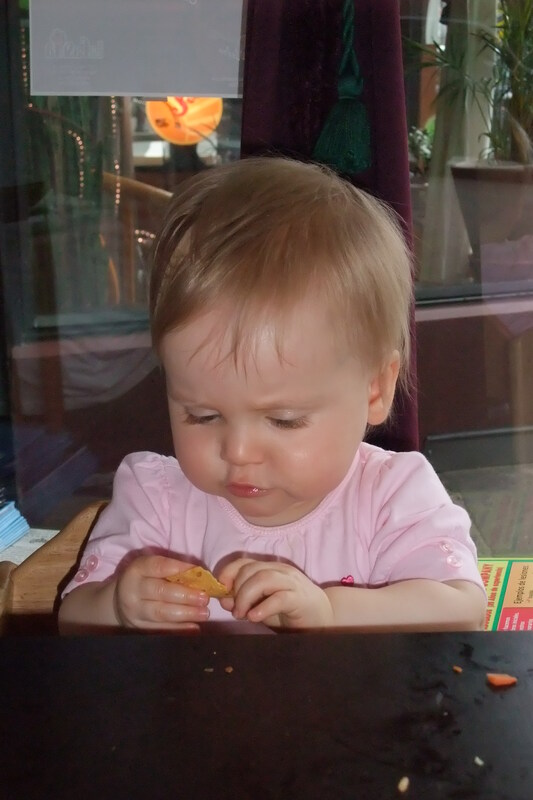 from the highchair when we left. Oh well, I’m sure a less fortunate little one can benefit from them as they are easily replaceable for us. Mexico, I like the way you cook. 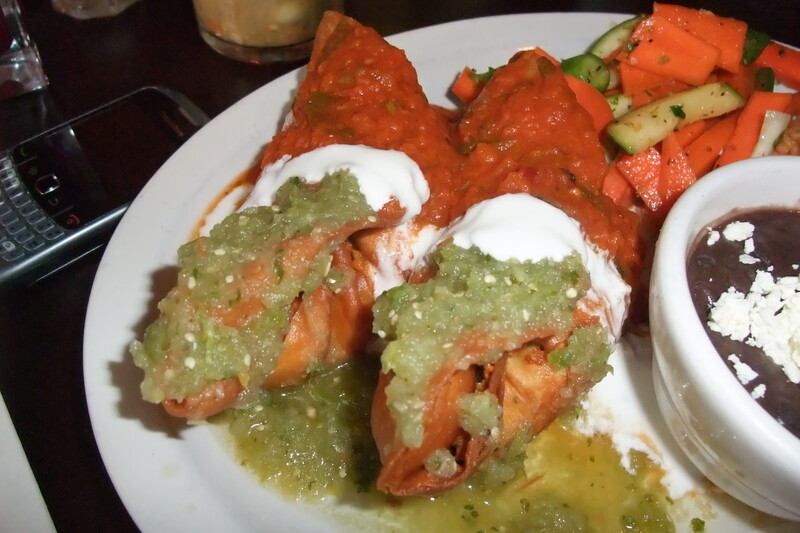 A tribute to Mexican food – Stupendous !